Don’t miss our next Chapter Meeting – the first one of 2015. Click here to download a flyer to print out and post around your office or kitchens. Guests are welcome. 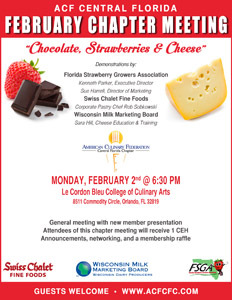 A trio of demonstrations are planned – Chocolate, Strawberries & Cheese”. This meeting will also be the first new member induction ceremony of 2015. Come meet new chefs. Guests welcome. NOW CASTING CNBC’s RESTAURANT STARTUP! CNBC’S Restaurant Startup is currently casting for the next season and wanted to inform you about the search! Do you have a unique restaurant or food concept that deserves an investment? Do you think you can turn a huge profit? Restaurant moguls Joe Bastianich and Tim Love are looking to invest their own money into America’s next generation of culinary superstars! If you impress, they invest! Whether you are looking to open your first restaurant, or hoping to expand to a second location, they want to hear from you! Click here to download a copy of their flyer, which further details what they are looking for. To apply, please visit https://www.restaurantstartupcasting.com/. *Must have a minimum of 2 owners and be 18 years or older. If you have any questions, please e-mail restaurantstartup@shineamerica.com or contact Danielle Sload, Casting Associate with JS Casting Inc. at 212-359-9581 or danielle@jenscasting.com. The 2015 Chaîne des Rôtisseurs Jeunes Chefs’ Competition; February 28-March 1, 2015, will be held at the Art Institute of Fort Lauderdale which is located at 1799 Southeast 17th Street, Fort Lauderdale, FL 33316. Local phone is (954) 463-3000. Lodging has been secured at the Hilton Fort Lauderdale Marina, located at 1881 Southeast 17th Street, Fort Lauderdale, FL 33316. The hotel is an easy 5 minute walk from the Art Institute. Local hotel phone is (954) 463-4000. There are 10 rooms available at the hotel for competitors. Please have competitors ask for the group rate for “Chaîne des Rôtisseurs” when booking their reservation. Rate per room is $265.05 USD per night. Each room has two double beds so competitors who would like to share the cost of lodging may do so at their choosing. Click here for more information!